This year for our annual Worst Witch Party I volunteered to bring a treat. 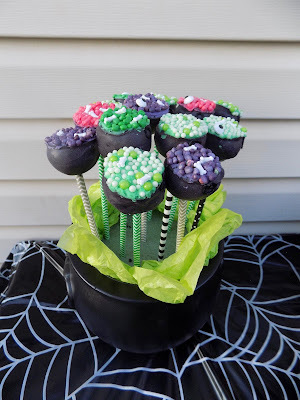 I had seen Cauldron Cake Pops online and thought that they would be so festive. A piece of advice... Do not make cake pops for the first time on the day of your event. I always put myself in these situations and I highly suggest you save yourself the hassle. Once your cake has cooled crumble it with your fingers in a large bowl. Roll the mixture into one and half inch balls and place on a baking sheet lined with wax paper. Place the balls into the fridge and let them chill for a half hour. Melt a small mixture of your chocolate melts in the microwave. Place one end of your lollipop sticks or straws into the melted chocolate and then stick half way through the cake ball. Repeat on each cake ball and then place into the fridge for an additional half hour. Melt the remaining chocolate in a bowl in the microwave. Remove the cake balls from the fridge and dip straight down into the chocolate mixture. Rotate until the cake pop is fully covered and let the excess chocolate drip off. Immediately place the cake pop bake onto the baking sheet. This will make the chocolate dry flat and create a brim for our cauldrons. While the chocolate is hardening dye your white frosting to your desired colors. I did green, purple and pink. This will match the color of the candy I will be placing on top for the witches brew. You can also dye the frosting red and orange and add flames to the bottom of the cauldron. I liked the look of a plain caldron. Once the chocolate has hardened we can start to decorate. If you want to add flames, do so first. You can add them to the bottom of the cauldron while the cake pop is resting on the baking sheet. Frost the top of the cauldron with your desired color of witches brew. Dip the wet frosting into the matching candy. Add candy bones and candy eyeballs for extra decoration. Place the black frosting into a piping bag and draw circles on opposite sides of the cauldron for handles. Place the cake pop into your foam black and let the frosting harden. I would recommend poking holes into the foam block with a stick or straw before placing the cake pop in. I placed my foam block in a plastic cauldron and added some green tissue paper for decoration. They turned out so cute and were a hit at the party! Cake pops are very time consuming. I would recommend making the pops the day before and then decorating the day of your event.